Medical Health Officer Dr. Nnamdi Ndubuka at the Nov. 24, 2016 seminar. 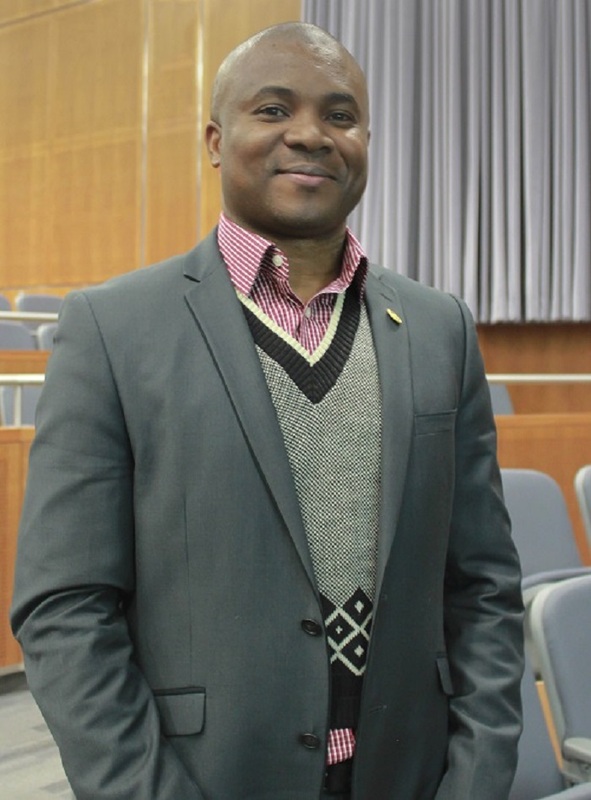 On Nov. 24, the School of Public Health (SPH) welcomed Dr. Nnamdi Ndubuka to the University of Saskatchewan to deliver a public presentation which underlined the HIV crisis facing Indigenous populations in the province’s northern communities. Dr. Ndubuka is a medical health officer with the Northern Inter-Tribal Health Authority (NITHA), a partnership organization made up of four Indigenous health partners which provide nursing, public health and primary care treatment services to 33 northern Saskatchewan communities, serving an on-reserve population of approximately 35,000. NITHA actively works with Indigenous communities to provide HIV testing, awareness, education and treatment services. The presentation, titled HIV Epidemiology in Northern Saskatchewan, showed how differences in determinants such as values and beliefs, work, the legacy of Indigenous residential schools, living and social environments, and personal health practices in Indigenous communities leave its populations more vulnerable to high rates of HIV infection than non-Indigenous groups, with a disproportionate concentration of cases occurring in the province’s northern communities. Lack of knowledge about the disease, poor access to mainstream health services, and a basic mistrust of non-Indigenous healthcare practices are just some of the challenges these communities face. Where health facilities are available, fear of the stigma associated with having HIV and the subsequent social isolation prevent many from accessing testing services or seeking treatment. Saskatchewan’s HIV rate has continued to make headlines for all the wrong reasons this year, revealing a dire situation. The rate of HIV infection in the province is comparable to Third World countries, with new cases at twice the Canadian national average. Research indicates that while the infection rate for the province’s non-Indigenous population is below the national average, rates among Indigenous and Métis populations, which experts suggest represent approximately 70 per cent of new cases, are higher than some African nations. For a wealthy and developed country, these statistics are shocking. Global healthcare professionals have suggested that Saskatchewan is failing its Indigenous peoples, with local physicians calling for the provincial government to escalate the situation to a public health state of emergency. For this reason, NITHA’s work with Indigenous communities in northern Saskatchewan is more important than ever. Dr. Ndubuka explained how NITHA has been successful in increasing testing rates through community-based ‘know your status’ campaigns and routine primary care clinic visits that aim to test people for HIV early on. The organization provides educational initiatives to increase awareness of the disease and that it can be managed through proper treatment, to debunk the myth that HIV is a death sentence. NITHA is also successfully expanding physician services available in the communities, and has formed strong collaborative partnerships with agencies such as the Northern Healthy Communities Partnership (NHCP), which works to improve the health of northern Saskatchewan’s population by influencing everyday living conditions, and all-important relationships with Indigenous health organizations such as the Saskatchewan Indigenous Council on HIV and AIDS (SICHA) and the First Nations and Inuit Health Branch of Health Canada. Gaps in Indigenous population surveillance data currently present a formidable challenge to developing the culturally-focussed health interventions, policies and programs needed to address Saskatchewan’s HIV epidemic, and Indigenous communities’ mistrust of non-Indigenous academia can form barriers to much-needed community-based research. Which is why, Dr. Ndubuka explained, it is vital for researchers to create ‘ethical space’ between academia and Indigenous belief systems, by promoting teamwork and equality among all research partners. Involving highly respected community Elders at an early stage, honouring Indigenous principles of data ownership, control, access and possession, and being upfront about how research data will be used are also a critical part of this process. Respecting Indigenous knowledge, value and belief systems holds the key to building trust and successful research relationships with northern Indigenous communities, and developing the innovative solutions desperately needed to alleviate Saskatchewan’s HIV crisis. Dr. Ndubuka’s presentation concluded that there is significant work to be done in Saskatchewan to meet the United Nations Program on HIV/ AIDS (UNAIDS) goal of ending HIV as a public health threat by 2030. NITHA continues to develop community-driven strategies to meet that goal, including working with Elders and health partners to increase the number of Indigenous communities offering HIV testing, and to deliver consistent messaging to enhance awareness of the disease. Challenging the mistrust and fear of stigma and discrimination that exists in many of these communities will take continued engagement and careful relationship building. Integrating traditional Indigenous health practices into mainstream HIV prevention and care programs is essential to successfully moving forward in creating culturally-relevant programs and policies, as is respecting that each Indigenous community operates differently, and is moving towards tackling HIV at its own pace. Changing the HIV trend will not be a simple task, nor one that Saskatchewan’s health services can achieve alone. It will require a level of commitment and involvement from many different sectors to come up with a long-term, sustainable solution.